Short film depicting a fictional educational film about fork lift truck operational safety. The dangers of unsafe operation are presented in gory details. 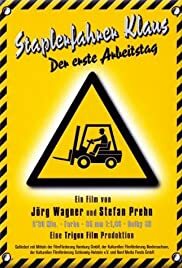 If you have ever wondered if a forklift could be used as a deadly weapon, look no further than the German short film Staplerfahrer Klaus: Der Erste Arbeitstag. It starts out like any one of those cheesy workplace safety videos, with the narrator and animations explaining the do's and don't's of forklift operation, as our main character Klaus blunders his way through the first day of work. However, it's not long before his mistakes result in his coworkers dying in hilariously over-the-top gory fashions. Even as if the body count grows higher and higher, the film never really stops trying to be a serious workplace safety video, which is why the whole thing had me in stitches. Staplerfahrer Klaus is in German, but you certainly don't need to understand the language to enjoy this short.